The Rev. Jack Eichhorst of Sartell met the Rev. Dr. Martin Luther King Jr. long before that towering civil-rights leader became famous, and he was in Atlanta when the murdered King was put to rest 50 years ago. On Jan. 1, 1960, Eichhorst, along with other students, met and talked with King when he visited an International Missions meeting at the University of Ohio. At the time, Eichhorst was a student at Luther Seminary in St. Paul. He and other students drove to the Ohio conference where King was a guest speaker. Eichhorst asked King if he would be willing to come to Luther Seminary to give a talk. King referred Eichhorst to his assignments assistant, but King later became so busy with his civil-rights work he was unable to make the trip to St. Paul. “I had always been interested in civil rights,” said Eichhorst, now 83, who grew up on a farm near Washburn, N.D.
Eichhorst had a long and distinguished career as a teacher and pastor, including a doctorate degree from Yale University, study in Germany and a prestigious Fulbright Scholarship. He was also a teacher in research development at St. John’s University. While there he was instrumental, along with a priest, in opening up a longtime dialogue between Catholics and Protestants, something that had long been frowned upon because of entrenched theological rigidities. Eichhorst said he is very proud of having helped start that ecumenical dialogue. While teaching in Albert Lea, Eichhorst became the advisor for the Afro-American Student League and began to gather a myriad of insights into the black experience in the United States, including the cruelties and crimes, including lynchings, in the American South and elsewhere. While at Yale University, he knew many of the young-student Freedom Riders – mostly white students who would travel to the South and help with black-voter registration and social-help programs for impoverished black people. Three of those Freedom Riders – two white men and a black man – were abducted and shot to death by white thugs in Mississippi, a crime that caused worldwide shock waves and helped bring attention to the prejudice, hatred and violence that were seething as blacks demonstrated for their rights and then began to act upon those rights by voting. It was while Eichhorst was teaching at the college in Albert Lea when he got a phone call from his wife, Judy, to tell him the horrifying news: Dr. Martin Luther King Jr. had been assassinated in Memphis, Tenn.
Eichhorst immediately met with black students, and they made plans for a big memorial service in Austin. Then he and others, mostly blacks, decided to fly from Minneapolis to Atlanta for King’s funeral. When they arrived, Eichhorst slept on a church pew. Next day, he stood in a very long line with others to view King’s body in its open casket. Next there was a church service at Ebenezer Baptist Church, King’s home church. The funeral was not open to everyone, but Eichhorst stood on a hill and watched all of the famous people who gathered for the ceremony. He remembers seeing Robert Kennedy arriving, who would himself be killed by an assassin a few months later. After the church service, the coffin was put onto a rural Southern farm wagon pulled by mules. Thousands of people followed the casket to the burial site. Eichhorst remembers following, arm-and-arm with Minneapolis Mayor Arthur Naftalin and a Minnesota political leader whose name he can’t remember. Edifying, Eichhorst explained, because of the millions of people King had touched with his gospel messages and his civil-rights activism. Five years after the funeral, Eichhorst heard King’s father speak at a convention in Detroit not long after another horrific tragedy – the assassination of King Sr.’s wife, Alberta, during a service in Ebenezer Baptist Church where King Sr. himself was pastor for many years. Meeting King, attending his funeral, were not the only brushes with history experienced by Eichhorst. On Nov. 22, 1963, in Dallas, Texas, President John F. Kennedy was assassinated in a motorcade. His wife, Jackie, sitting by his side, erupted in panic after the shots rang out and crawled on hands and knees from the open limo onto the back of it. The Secret Service agent who pushed her back into the limo was Clint Hill, who has served under five presidents. He happened to be a high-school friend of Eichhorst so many years previously, back home in North Dakota. In 1964, Jack and Judy Eichhorst took a trip to Washington, D.C., and were able to visit for a time in the White House with Clint Hill. Eichhorst said he often feels King’s spirit is being lost. While studying in Eastern Europe, in cities like Budapest, Eichhorst became acutely aware of the tyranny of communism and how so many naïve people in the West were taken in by such ideologies. Eichhorst does hold out for hope, however. He is a strong believer in the power of God as transformative experience and notes Christianity has been increasing hugely in so many countries in Africa, Asia and South and Central America. Eichhorst’s wife, Judy, has also been tirelessly active in church activities throughout the decades. The couple has four children: Daniel, who teaches in Japan; Martha, who lives and works in Bolivia; Nathan of Boise, Idaho; and Stephen of Corpus Christi. The Rev. Dr. Jack Eichhorst and wife Judy have enjoyed an extremely active life together working on behalf of the Word of God and the gospel messages of love and kindness. 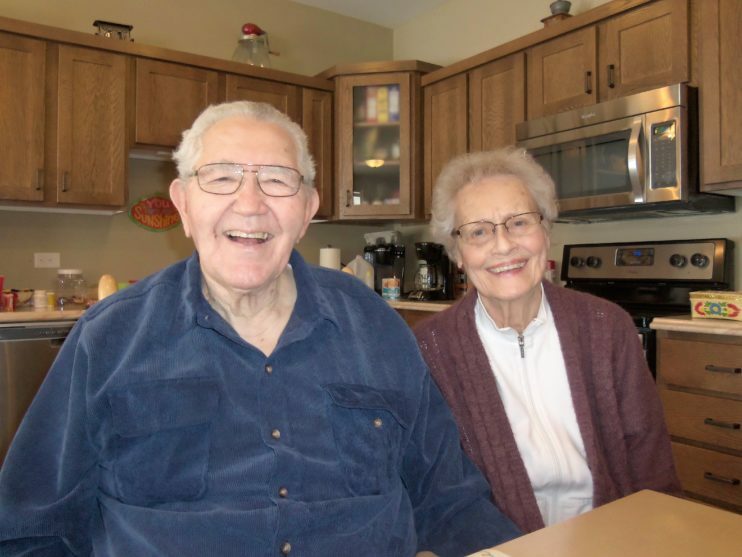 Now retired, they live in the Waterford Apartments in Sartell.